Some days it is in the mundane activities of daily life where I face my acculturation challenges. Take cooking, for example. I don’t mean to complain. 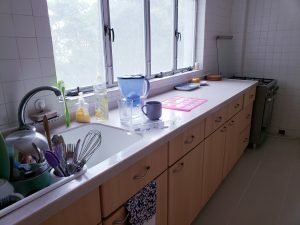 I have a kitchen, while many people in Hong Kong’s compressed living spaces have a miniscule kitchenette. Compared to that, we have an embarrassing amount of space devoted to food preparation. 16 drawers and 10 cabinets arrayed along the sides of a corridor that looks a lot like a bowling alley. Space is nice, but here’s the challenge. In an American kitchen, the stove, refrigerator, and sink are usually triangulated for maximum convenience. In our kitchen, the stove is positioned at one far end, the sink at the other far end, and the frig (2/3 the size of a standard American refrigerator) across from the sink but tucked directly behind the kitchen door. This arrangement is custom made for maximum dripping and dropping between appliances. Beyond the drips, I can make a really big mess on a really long counter. Cooking requires shopping, and shopping from where we live on campus requires forethought and time because we either have to walk up a mountain and down the other side to get to the small campus store or take a shuttle and a train to a bigger store or a market. Once off campus, we have a range of options—inexpensive wet markets (meat and fish) and street stands (fruit and veggies) to pricey grocery stores with international delicacies. In between, we have outlet stores, neighborhood stores, specialty stores. What we don’t have is Costco where we shopped for the 19 years we lived in Hawaii. Products here come in small packages. Which is good, because everything we buy has to be carried home in a backpack. More forethought. Starting a kitchen over from scratch is a good lesson in what staples I assume I have on hand. At least all my spices are fresh. Cooking requires equipment, and we moved here with one box of cooking utensils. After a gazillion trips to IKEA to purchase pots and pans and accessories, we are now equipped for basics. We have a set of three pots with lids and two frying pans—odd sizes but workable. Fred has a wok and cooking chopsticks. I have a rolling pin, a pie plate, and a loaf pan of wonky Scandinavian dimensions. We have an oven—a luxury not found in older Hong Kong kitchens (the Brits introduced baking). 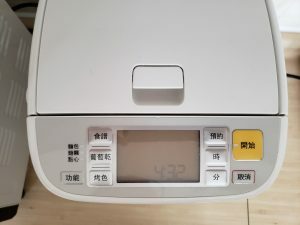 Although we swore we were going to keep it simple for the 5-6 years we live here, one counter has sprouted a toaster oven, a bread machine, a microwave, and a hot water dispenser. Seems excessive, but I can explain. 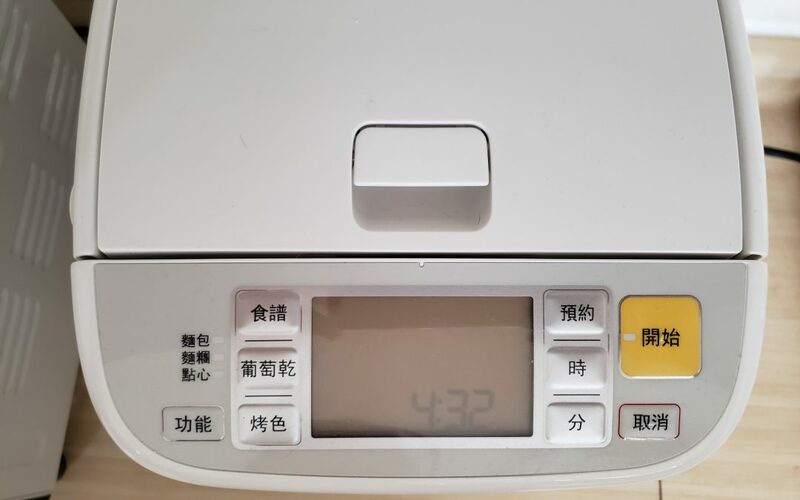 The toaster oven came about because the numbers on the gas oven dial (gas cooking—another transition) bear no relation to the actual temperature inside. I know this because I had to buy an oven thermometer, which it also doesn’t have. What we didn’t realize was that the toaster oven can only be set for sixty minutes and is smaller than the new muffin pan from IKEA. The bread machine is because most of the bread sold in Hong Kong is the consistency of Wonder Bread. The instructions are in Chinese, and it makes tiny loaves, but they have substance. The water dispenser is standard equipment in Asian kitchens. I want one when I move back to the US. I’m not explaining the microwave. Cooking requires math. Being an American abroad carries a host of embarrassments from the majority of us being monolingual to the hypocrisy of our politics. Being one of three countries in the world (Burma, Liberia, and the US) that haven’t adopted the metric system is up there on the list. My crummy math skills have led to a few cooking disasters over the years when I tried to double and triple recipes. Now imagine my brain on metrics. It only took me three weeks to notice IKEA pans have liquid measurements marked on the inside. My metric recipes strongly suggest a scale should be next on the small appliance list. So today I am making a mushroom leek pie. I’m using bread flour because I was not about to walk uphill to get plain flour. I measured my flour in cups instead of grams because I don’t have a scale, and the recipe called for two sticks of butter when mine comes in one big 200-gram block. I used the old-fashioned two knife method to cut in the butter because my food processor and pastry cutter are in storage. Wish me luck! I spend a lot of time squatting in front of the stove trying to read the thermometer and regulate the wild fluctuations in temperature.